Are you constantly getting stiff and achy? It might be about time for you to work some yoga into your day. A lot of people really just can’t seem to find the time between work, family, friends and hobbies. It starts to feel like such a chore to free up some time for yourself. There is hope though! Even just incorporating some simple, discreet, and quick yoga moves into your time behind your desk can really help you a lot. Here are some of the best chair yoga postures you can do comfortably from your desk without drawing any unnecessary attention from coworkers. These can all be done as quickly or as slowly as you like so feel free to play around with it. Seated comfortably in your chair with your hands by your side or holding onto the armrests. As you are inhaling, reach your head up and back while allowing your chest to come forward so that there is an arch in your back. As you are exhaling, pull your tummy back until your body comes past neutral to arch the opposite way with your head forward and your back rounding towards the back of your chair. Carry on with your breathing as long as you like. You can play around in these positions. Start with being seated comfortably in your chair with your hands to either side of your knees. Inhale deeply and take a moment to straighten your back. As you exhale, fold forward from your hips keeping your back straight. Once you cannot go any further you can begin to round your back and relax your head down towards the floor. Your hands can come down to your knees or to the floor in front of you. You can stay here for a few breaths or slowly come back up. Make sure to take your time coming back up so you do not get dizzy! Start by being comfortably seated in your chair and place your hands slightly behind your hips with your fingers pointed forwards. Straighten your legs out in front of you and plant your feet firmly into the floor. As you inhale lift your head up and back so that your chest comes out forward and your back begins to arch. Remain seated and be sure to not strain your neck by reaching/arching too much. Hold this for as long or as little as you like. These poses are all focused on bringing movement back into your spine to help with any stiffness you may experience from hunching at a desk all day. They are also very quick to get into once you get to know them. You can always play around with little variations here and there as you listen more to what your body needs. 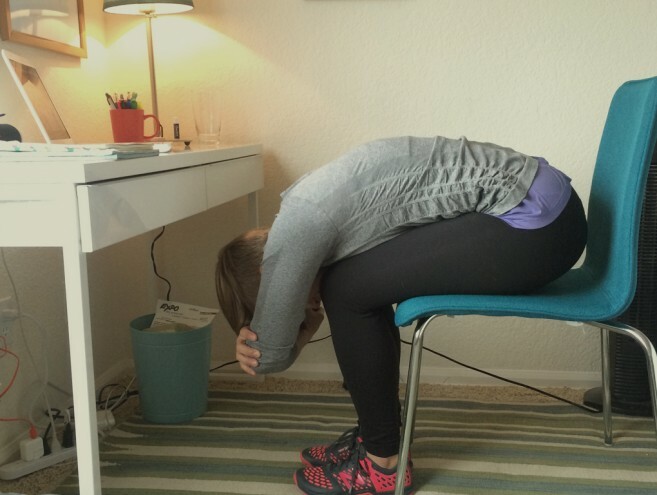 Now you are equipped with 3 very effective and efficient chair yoga poses to use at work. Enjoy and Namaste!